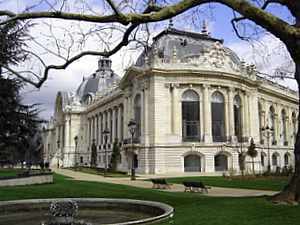 The Petit Palais was constructed for the Universal Exposition of 1900 by architect Charles Giralut (1851-1932). Giralut also supervised the construction of the Grand Palais across the street which was also built for the Exposition Universelle of 1900. These two buildings, plus the Alexander III bridge, form a monumental unit. 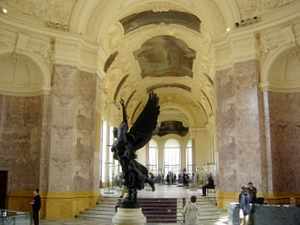 It was officially inaugurated on December 11, 1902, as the Palais des Beaux Arts de la Ville de Paris, the Palace of Fine Arts of the City of Paris. It has just undergone a 4 year, $84 million renovation. It re-opened in December, 2005. 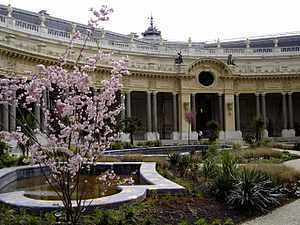 The design of the Petit Palais is a building of four parts surrounding an inner garden. Large windows afford views of the Gardens of the Champs-Elysées. The building is filled with daylight while still protecting the works of art. This, plus the wide uncluttered halls and the high rounded ceilings, gives a sense of openness and freshness. The main entrance is reached by a small flight of stairs leading to large glass doors which are set in gilded wrought iron frames framed by ionic columns. One enters directly under the dome of the building. It is an elegant and impressive introduction to this wonderful museum. The interior of the building is in the neo-baroque style with carved decorations in the walls, marble columns and walls, a beautiful mosaic floor with frescoes adorning the ceiling. The first major contribution to the Palais des Beaux Arts de la Ville de Paris, as it is officially called, was the collection of Auguste Dutuit (1812-1892) and his brother Eugene (1807-1886), collectors of over 20,000 works of art including antique ceramics, prints, drawings, rare books and medieval objects. Auguste Dutuit also left a fund for future works to be acquired. The permanent collection ranges from art of ancient Greece to the First World War era. It is displayed by periods and by style, allowing for comparisons and the recognition of influences of the different artists. 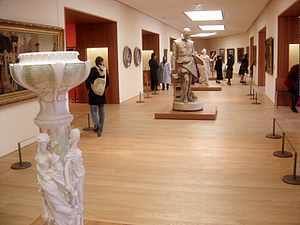 The different categories of the collections on exhibit in the permanent collection of the Petit Palais are: Paris 1900; the 19th Century; the 18th Century; the 17th Century; the Renaissance; the Christian World in the West; the Christian World in the East; Roman and Greek Antiquities. Some of the artists represented here are Poussin, Rembrandt, Géricault, Delacroix, Courbet, Carpeaux, Guimard as well as Pissarro, Cassatt, Renoir, Sisley and Cezanne. 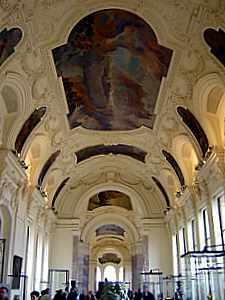 One could say that it is a connecting link between the Musée du Louvre and the Musée d'Orsay. The northern half of the building contains the permanent collection. The southern half hosts the temporary collections. Both parts of the building offer access to the lovely interior garden with its ponds and palm trees, refreshing air and quiet. The Petit Palais is open Tuesday-Sunday from 10 a.m.-6 p.m. It is closed on Monday and holidays. The Temporary Exhibit is open on Tuesday until 8 p.m.
9 euros for adults; 6 euros for those over 60 years of age; 4.50 euros for those between the ages of 14-26 and free for those under 14 years of age. The building is wheel-chair accessible. 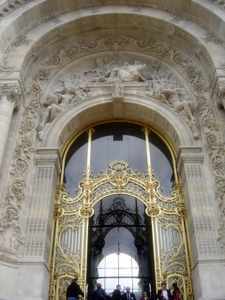 For further information, here is the Petit Palais Official Website.